Now on sale! 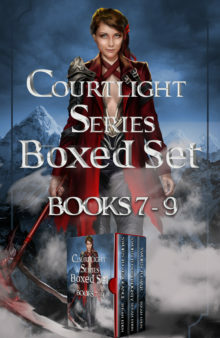 The third set in the wildly popular Courtlight series, Courtlight Series Boxed Set Books 7-9, for one discounted price. Begin anew the books that has readers raving for more fantasy, adventure, fun, and romance! Sworn To Vengeance Ciardis Weathervane is nothing if not resourceful but she and her friends are running out of time and options. They have come across a walled city with thousands of hungry souls who demand a price: the prince heir. As Ciardis fights to save him she realizes just what it means when an empire decides its people are a sacrifice worth making. Sworn To Sovereignty Chaos reigns as Ciardis Weathervane returns to Sandrin. There’s a revolution fomenting and its leadership wants the emperor’s head. Will Ciardis work with or against them as the gods descend down from the heavens to destroy everything she holds dear. Sworn To War Ciardis Weathervane is facing a war on two fronts. With Thanar trapped in purgatory, its up to Ciardis and Sebastian to buy them time before they must battle a god bent on living forever. You’ll never find a set of books more exhilarating than the Courtlight series, its time for your next fix in the fantasy world that has readers riveted!